I've read a lot of books on climate change from both sides of the debate, and I think this one … is a standout. "This is an awesome lecture/video and I recommend everyone watch it!!!" "I love the voice of reason presented like this"
"I do wish this interview was shown on every network in this country (USA), and at every school!" and universities around the Western world, the younger generations would vote more wisely and think more carefully. CEP Meeting, chaired by President Vaclav Klaus, Prague, Czech Republic, December 8, 2010. 6th International Conference on Climate Change, Washington, July 1, 2011. "The best lecture on man-made global warming I have seen." Public meeting convened by Dr David van Gend, October 9, 2012. Panel interview with Dr Willie Soon and Mr Joe Bast, THI Washington, September 23, 2013.
increase in CO2 levels, a known greenhouse gas, doesn't necessarily lead to a dramatic increase in mean world temperature." March 25, 2015, NIPCC Report, Heartland Institute, Chicago. important facts, caveats and doubts on scientific subjects related to the cause of climate change. 263. What has climate change got to do with energy supply anyway? commonplace, are in fact an evil every bit as pernicious as direct scientific fraud. government agency or university representative corrects them? [Other versions in the Westmoreland Times, Bucks County Courier Times, Turkish Weekly & Eurasia Review]. who employ censorship, dishonesty, and aggression in an attempt to frighten the world into rash action. [Related Letters: (i) From Jan Wright; (ii) From Bob Carter, Andy Aspersen; Geoff Henderson; (iii) (unpublished) From Professor David Palmer]. Letter, The Australian, Oct. 25, 2014. [Related links: 1. Opinion, Time for Cooler Heads to Prevail by Nick Cater, Oct. 23; 2. 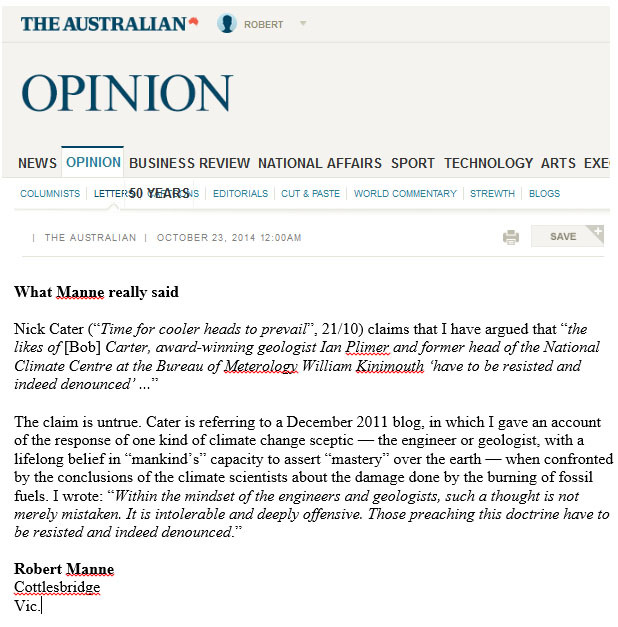 Letter by Robert Manne, Oct 23]. Bob Carter & 10 co-athors, NIPCC Policy Brief, The Heartland Institute, Chicago, 44 pp. [Related press coverage: (i) Bay Post Maruya editorial, Nov. 6; (ii) Bay Post Maruya article, Nov. 7]. Opinion (with Tom Harris), Providence Journal, Oct. 21, 2014. Opinion (with Tom Harris), Taunton Daily Gazette, Oct. 21, 2014. Opinion (with Tom Harris), The Washington Times, Oct. 20, 2014. Unpublished Letter to The Australian, Oct. 19, 2014. Guest Essay (with Tom Harris), Watts Up With That?, Oct. 8, 2014. Letter, The Australian, Sept. 24, 2014. Opinion, New York Post, Sept. 14, 2014. Critical essay here , Sept. 13, 2014. Australian winter frosts destroy grain crops: is this a harbinger of cooling? Letter, The Australian, Sept. 13, 2014. Comments at Watts Up With That. Unpublished Letter to The Australian, April 23, 2014. No pause in global warming is known to have occurred. Rather, global warming stopped 17 years ago; it may or may not resume. Letter, The Australian, February 11, 2014. Doomed Planet Opinion, Quadrant Online, December 4, 2013. Heartland Institute, Chicago, October 16, 18 pp. Heartland Institute, Chicago, September 23, 2013, 20 pp. Heartland Institute, Chicago, September 23, 2013, 1000+ pp. Opinion, Daily Telegraph (Sydney), September 17, 2013. Dr Colin Summerhayes, Vice-President, The Geological Society of London. and climate events are Australia's greatest natural hazard. This is not just a "consensus" of advice, but a fact. Letter, The Australian, January 30, 2013. American Institute for Technology and Science Education, Essay, January 30, 2013. Contrary to Dr Trewin's assertion, global average sea-level is almost irrelevant for the purposes of practical coastal planning and management. Hurricane Sandy was not due to global warming, an the Climate Commission is wrong to claim otherwise. Opinion, The Age, November 8, 2012. Newly released CSIRO Marine Report Card has the content and importance of an ephemeral publicity flyer. Quadrant Online, Doomed Planet, August 28, 2012. Why do governments take advice on the scientific issue of global warming from an unaccountable, political brnnch of the UN? Opinion, Capitalism.HK, July 18, 2012.
it accords with empirical evidence. Opinion, The Australian, June 27, 2012. National Post (Canada), Opinion, May 23, 2012. 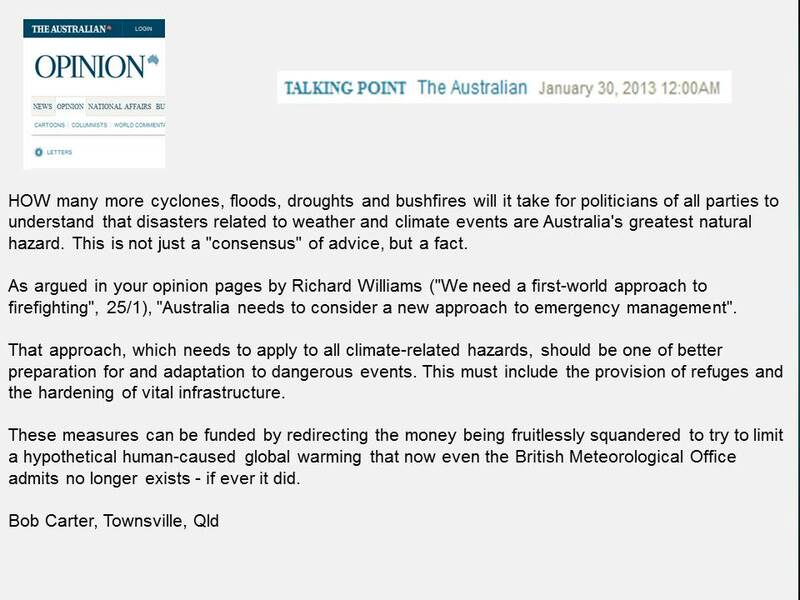 Opinion (+ 50 comments), The Australian, April 18, 2012.
or is likely to occur. Quadrant Online, April 5, 2012. Something is very wrong with the way in which scientific policy regarding climate change is being delivered to the Australian government. Quadrant Online, April 4, 2012. Letter, Newcastle Herald, February 9, 2012. Opinion, Quadrant Online, February 9, 2012. 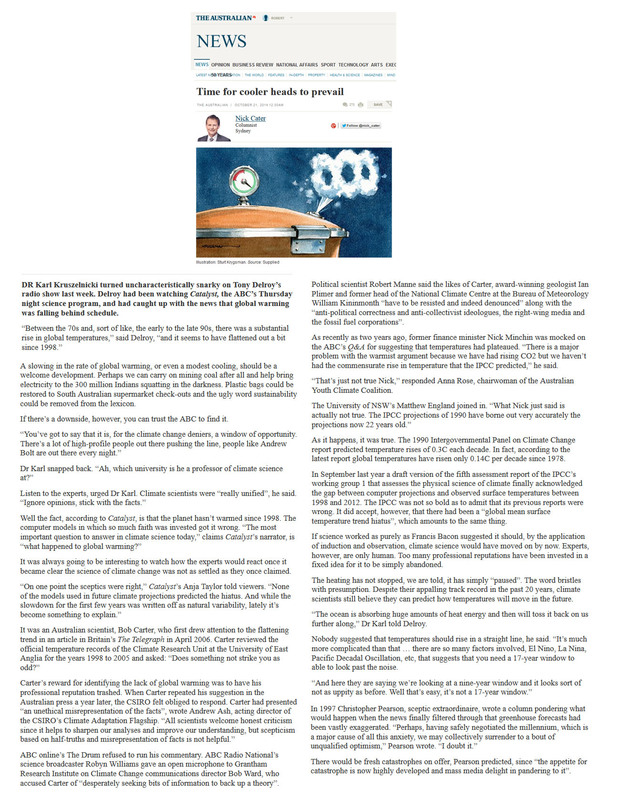 Opinion, The Australian, February 7, 2012. Opinion, Quadrant Online, February 7, 2012. Opinion, Quadrant Online, February 6, 2012. Opinion, No Frakking Consensus blog, February 6, 2012. For a balanced and balancing perspective on allegedly dangerous global warming, consult the 2011 NIPCC-2 Interim Report. The Rock River Times (Illinois), Guest Column, December 7, 2011. Letter, The Australian, December 6, 2011. Letter, The Australian, November 22, 2011. Daily Digest, Pajamas Media, November 6, 2011. 203. Can we please stick to the science? 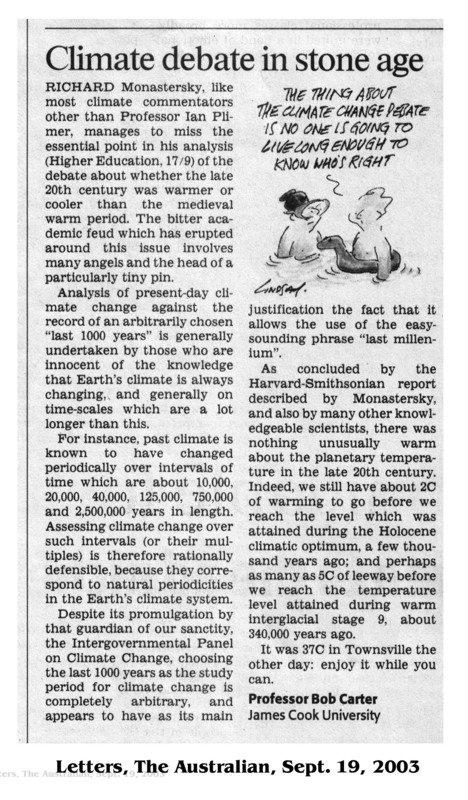 Opinion, The Daily Climate, October 4, 2011. Letter (unpublished), The Australian, October 3, 2011. 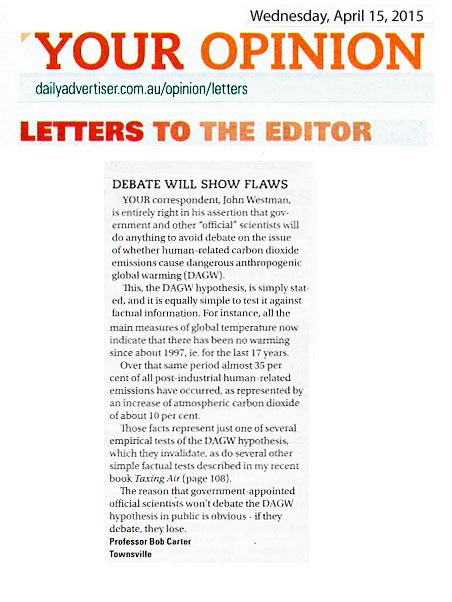 Opinion, The Wagga Wagga Daily Advertiser, September 6, 2011. Water, Air and Soil Pollution, August 12, 2011, pp. 2205-2206. Quadrant Online, August 8, 2011. Bob Carter explains how the Prime Minister's expert climate advisers are letting her down by feeding her frisbee science. Miranda Devine Blog, The Telegraph, August 5, 2011. 197. Malcolm Turnbull's climate politics: which "science" and which "morality"? view as do environmental activists on the hard left". Quadrant Online, July 25, 2011. "The government’s present plan to tax carbon dioxide represents economic vandalism, is strongly regressive and will have no measurable effect on future climate". 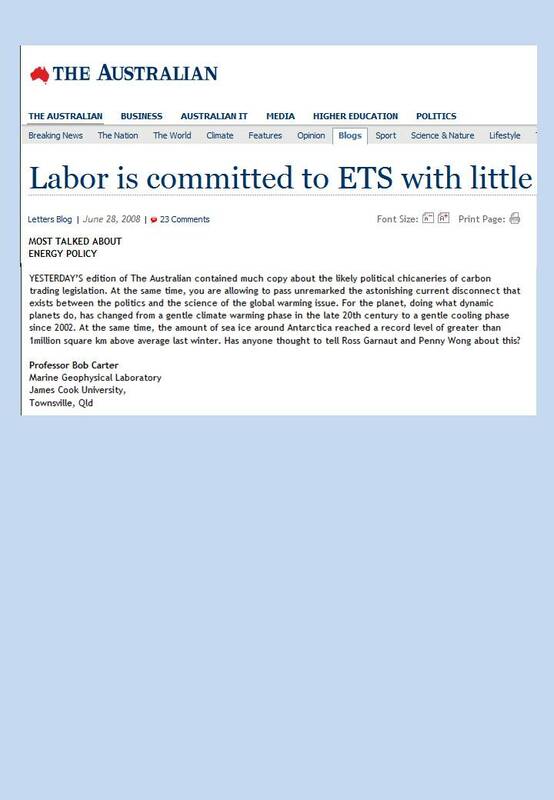 Unpublished letter to The Australian, July 9, 2011.
environmentally ineffectual carbon dioxide tax - and live to regret it". Opinion, Sydney Morning Herald, July 3, 2011. So the cost-benefit equation is this: ''Your family pays more than $2000/yr in tax in return for a possible global cooling of <0.001 deg. C". Opinion, The Age, June 27, 2011. Air & Waste Management Assoc. Conference #104, June 21-24, Coronado Springs, USA. "These data provide a test of Professor England’s favoured hypothesis that dangerous global warming will be caused by human-related carbon dioxide emissions. The hypothesis fails the test". Letter (unpublished), The Australian, June 9, 2011. 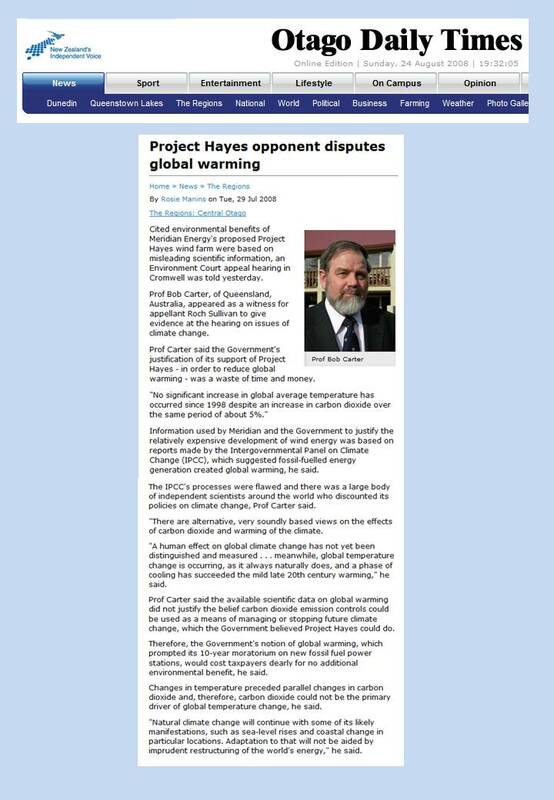 "Writers like Mr Steketee give prominence to the speculative, alarmist climate model outcomes promulgated by the computer engineers of the IPCC". Letter (unpublished), The Australian, June 4, 2011. What can be done to neutralize the politicization of science that has occurred in the hotly disputed field of global warming research? 70th birthday Festschrift Volume for President Vaclav Klaus, June, 2011. Letter, Australian Financial Review, May 13, 2011. How political spin and postmodern argument have now come to dominate public discussion of even scientific matters like climate change. Quadrant, May, 2011 (vol. LV, no. 5). Editorial comment on item 186. Quadrant Online, April 25, 2011. Scientific audit of the IPCC-derived advice rendered to the Australian government by science adviser Professor Will Steffen. Propaganda rather than reporting marks press coverage of a melting runway in Antarctica. 4 days of saturation press coverage, yet no mainstream journalist has discussed the real issue - which is the science of climate change. The government will assuredly change over this issue - the only uncertainty is when. At last NZ's major newspaper publishes a splash article reporting warm weather without AGW-propagandizing it. The cost-benefit of a carbon dioxide tax - less than 0.001 deg. C of warming averted for $2,000/family/yr. 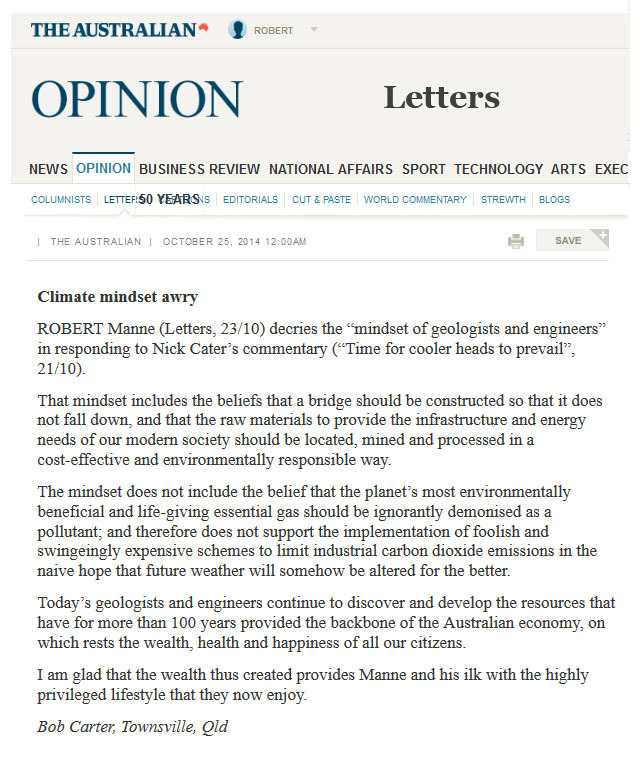 Response to letter by Tim Flannery. And the appropriate response is to prepare for, and adapt to, them. New Zealand has lessons to learn from Australian climate-related disasters: and the main one is the need for preparaton and adaptation. The 11 principles of the Multi-Party Climate Change Committee imply a course of action exactly opposite to the government's intended CO2 tax. Catch up, folks, global warming alarmism is dead - and the Canberra Multi-Party Climate Change Committee determinedly looks the other way. The solution to the climate change problem is planning to adapt to changes as they occur, not futile spending on either research or "mitigation". Showing Al Gore's film in English classes as part of a national Australian school curriculum is not a good idea. 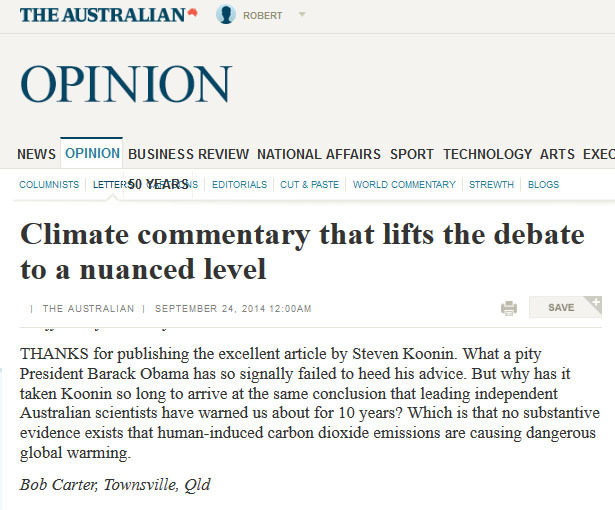 A rebuttal of unfair criticism of an independent commentator on climate change. Bjorn Lomborg's claim that dangerous human-caused warming is occurring is simply wrong. Investors.com (Investor's Business Daily), October 29, 2010. 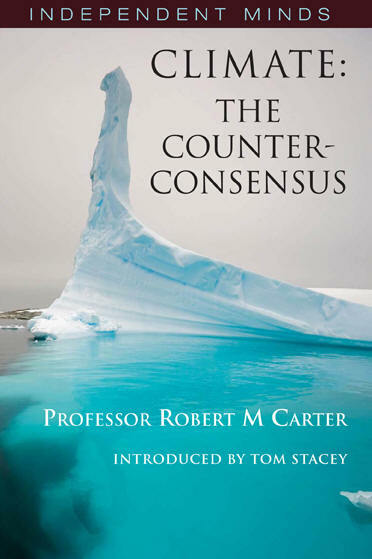 Martin Cohen reviews "Climate: the Counter Consensus" and finds it "to provide the perfect case study of reason and argument in practice". The Philosopher, Vol. LXXXXVIII, No. 2, Autumn 2010 (October 29). Quadrant Online, October 28, 2010.
carbon dioxide is a pollutant? How is such sheer ignorance possible? 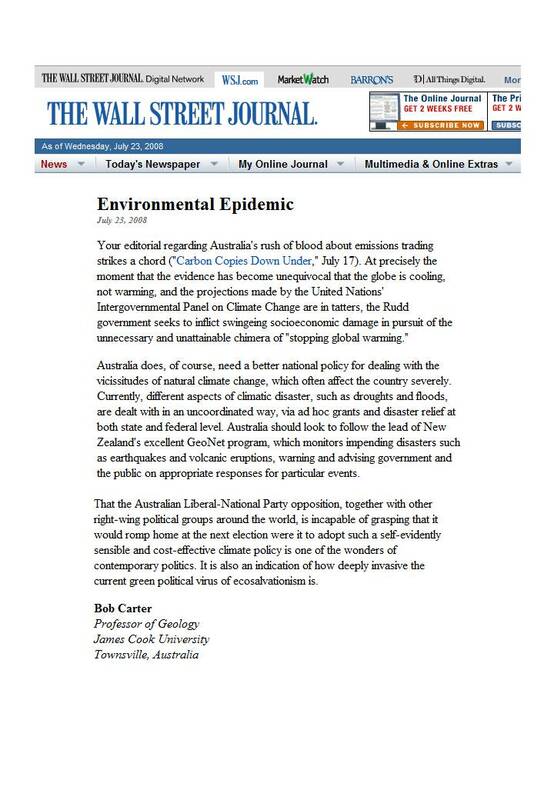 Letter in The Australian, October 27, 2010.
declaration that 'the time for debate is over'. It is not, thanks to people like Bob Carter". The Spectator (Australia), October 23, 2010; p. viii. contemplate and compare the contrasting conclusions that we draw in our two different essays. Economic Analysis & Policy, Vol. 40 no. 2, September 2010, pp. 145-146. Treating carbon dioxide as a pollutant is an abuse of logic, language and science. Unpublished letter to the Australian, September 18, 2009. 159. At last! U.K. adopts a climate policy of adaptation: will Mr. Combet follow? The UK has adopted adaptation to climate change as their primary policy; when will Australia follow suit? Quadrant Online, September 16, 2010. Quadrant Online, August 8, 2010. The phenomena of disinviation and the brotherhood of silence against climate "denialists"
Quadrant Online, August 1, 2010. Michael Duffy interviews Bob Carter about his new book. ABC Counterpoint, July 5, 2010. Seven basic questions about climate change are answered by experienced geoscientists Mike Sandiford, David Deming, John Geary and Bob Carter. The Australian Geologist (TAG), vol. 155, pp. 25-32 (June, 2010). The McLean, de Freitas & Carter paper in JGR (2009) on the links between average global temperature and ENSO is falsely criticized, and the authors are denied the right of reply. Science & Public Policy Institute, Paper, March 30, 2009. Alarmism about global warming stems from a famous 1988 warning delivered by James Hansen, who is shortly to talk at the Adelaide Festival. Quadrant Online, March 3, 2010. 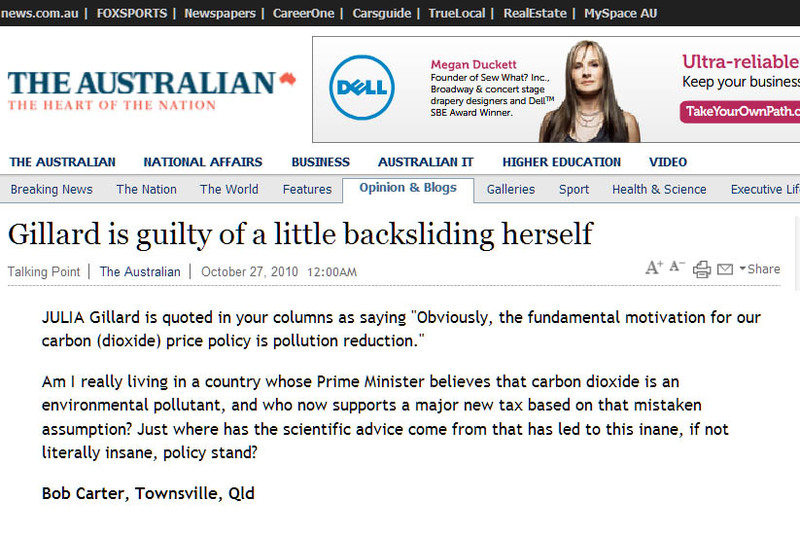 After years of editorial climate alarmism, The Australian's leader writer joins the ranks of the climate sceptics. Unpublished letter to the Australian, January 22, 2010. 151. Global warming: Is the science settled? Climate change policy Plan A hasn’t worked and won’t work: what’s Plan B? Creme de la Creme, One World Publications, January, 2010. Bob Carter responds to a critique (Bob Carter's attack on reason) of Artlcle 148 (below) by former Minister of Science, Mr. Barry Jones. Quadrant Online, Dec. 21, 2009. No scientific paper exists that demonstrates that the late 20th century warming falls outside the rates and magnitudes of past (geological) climate change. Sydney Daily Telegraph, Dec. 9, 2009. Every dollar that is spent on a false environmental issue such as dangerous human-caused global warming is a dollar lost to fixing real environmental or social problems. ABC, The Drum, Dec. 8, 2009. A review of Graham Bishop's new biography of the legendary New Zealand geologist Alexander McKay. The Australian Geologist (TAG), vol. 153, p. 35 (December, 2009). of political targetry and control. Bob Carter debates Andrew Glikson on the global warming issue. 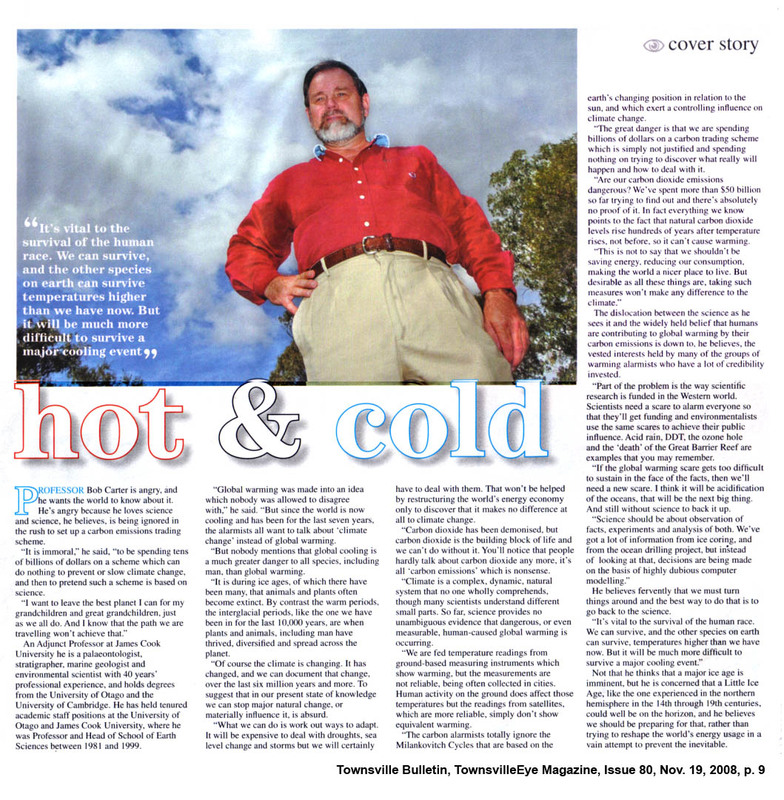 Viewpoint (Australian Christian Lobby magazine), Issue 1, October 2009. It is a critical matter of necessity to understand that, in addition to being political, IPCC advice is also based upon faulty, indeed manipulative, science practice. Quadrant Online, Oct. 25, 2009. No amount of carbon dioxide taxation, or human emissions reduction, will affect future climate. Newcastle Herald, Oct. 22, 2009. Climate hazard management policies need to be national and regional, not global, for climate risk inherently stems from local geography. Quadrant Online, Oct. 19, 2009. Watch this film, and use the knowledge that you will gain to lobby your Senator to vote against the Australian emissions trading bill. Quadrant Online, Oct. 12, 2009. The issue is not an Emissions Trading Scheme (ETS), but a proper national climate policy - why can't Malcolm Turnbull understand that? Quadrant Online, Oct. 2, 2009.
incapable of making accurate critical judgements on environmental issues? 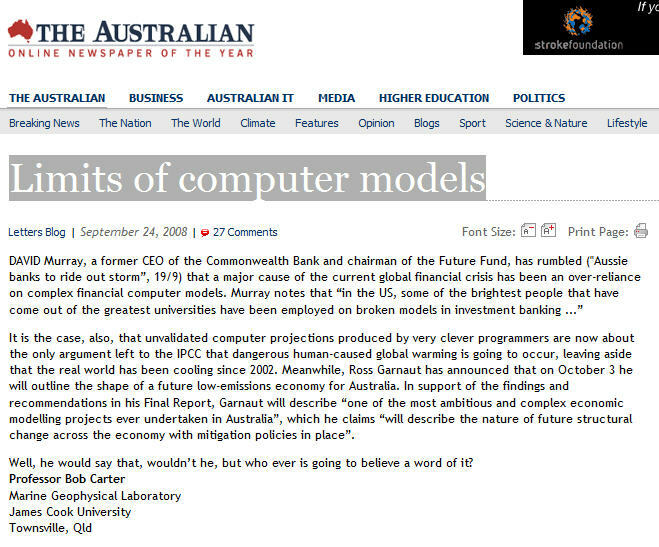 Quadrant Online, Sept. 28, 2009.
so popular with Australian global warming lobbyists and politicians? Quadrant Online, Sept. 21, 2009.
that needs to be measured and understood for good coastal planning. Briefing notes prepared June 2008. The government doesn't ask the world bank for advice when it sets its budget, so why does it ask the UN's IPCC to set its climate policy? Why is it so difficult to get an answer to three simple questions on climate change? 130. Which emissions trading scheme? Will implementation of ANY emissions trading scheme have a measurable effect on future climate? Climate science Minister Penny Wong is acting on the basis of flawed, if not incompetent, science advice. Why is it so difficult to answer three simple questions on climate change? 122. The envirospin of "clean coal"
120. Correction of "Look carefully at the motives of those sceptical of climate change"
118. IPCC Climate Alarm Advocacy has Failed: What's Plan B? 112. The problem is NATURAL climate change, stupid! 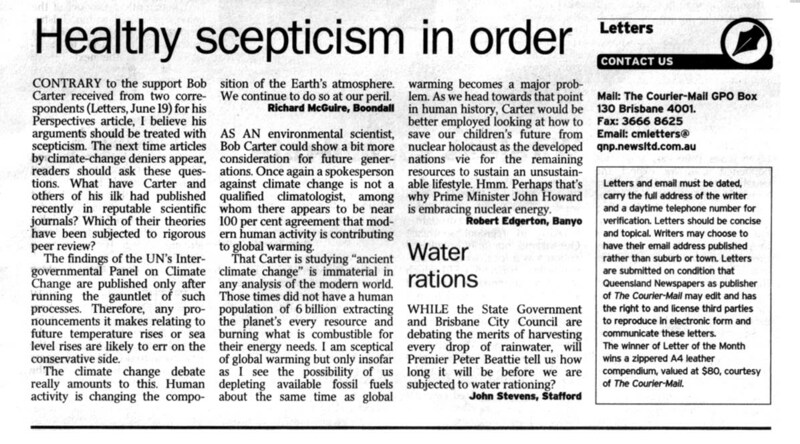 Opinion piece and interview with Bob Carter - "I'll be doing science until they nail the lid down"
Sunraysia Daily (Mildura), Feb. 18, 2009, p. 17. Which climate models should you believe: the GCMs that project warming; or the statistical models that project cooling? Opinion piece and interview with Bob Carter - "Science should be about the observation of facts, experiments and analysis of both"
warming policy that is based upon sub-prime science, sub-prime economics and sub-prime politics. left to the IPCC that dangerous human-caused global warming is going to occur. posed by the natural variability of the climate system itself is self-delusion on a grand scale. An emissions trading scheme will make no measurable change to future climate, and is therefore futile. The Eagle (St John's Anglican Cathedral, Brisbane), vol. 4 (3), p. 9.
of constructing a large, environmentally destructive windfarm? therefore failed in their duty of public care. 78. Letter to The Melbourne Age: is climate policy now being set by children? 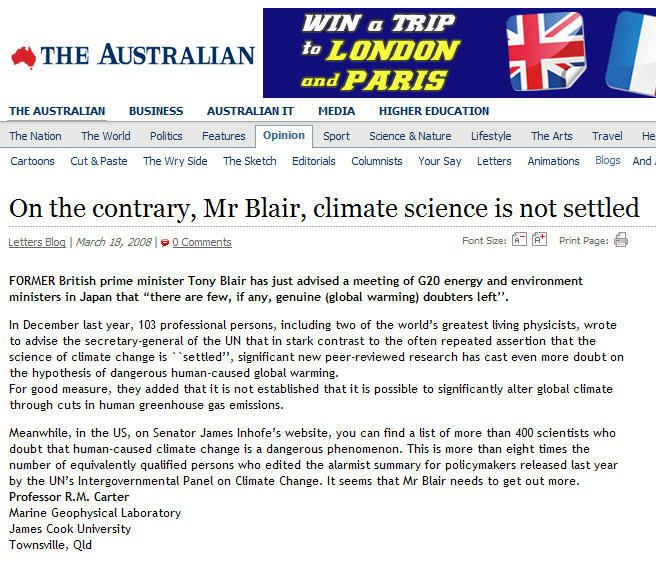 What's so special about global warming, Mr Blair? climate science paper in years", are "mouthpieces of the free-market agenda" and are "not credible climatologists". Ex-British PM makes the ridiculous claim that "there are few, if any, (global warming) doubters left"
on Climate Change - S. Fred singer et al. The question of media bias about global warming is in the news again. Courier Mail, Sept. 5, 2007. "The reality is that almost every aspect of climate change is the subject of vigorous debate"
57. Climate change: climate science and the Stern Review - by Carter, R.M. et al. 56. Climate change: response to Simmonds and Steffen - by Holland, D. et al. U.K. Sunday Telegraph, April 7, 2007. 53. The Stern Review: a dual critique. Part I: The Science. Part II: The Economics. Dec. 6, 2006 (i) RMC submission; (ii) additional tabled document. 49. For a balanced view on climate change - call the Tyndall Centre? 41. Cutting through the propaganda on global warming: the educator's responsibility? 40. Is Al Gore right on global warming? 29. Some things too crucial to be left to the U.N.
Melbourne Rotary Club, Address, June 16, 2005. Victorian Farmers Federation, Address, Regional Forum, Morwell, June 9, 2005.
Letters, The Age (Melbourne), May 5, 2005. Counterpoint interview, ABC Radio National (Host Michael Duffy), April 11, 2005. New Zealand Herald (Auckland), Feb. 7 to March 5, 2005.
Letters, The Diplomat 3(6), February-March, 2005, p. 4.
Letters, The Australian, January 4, 2005. 16. Climate Change - Reality or Myth? 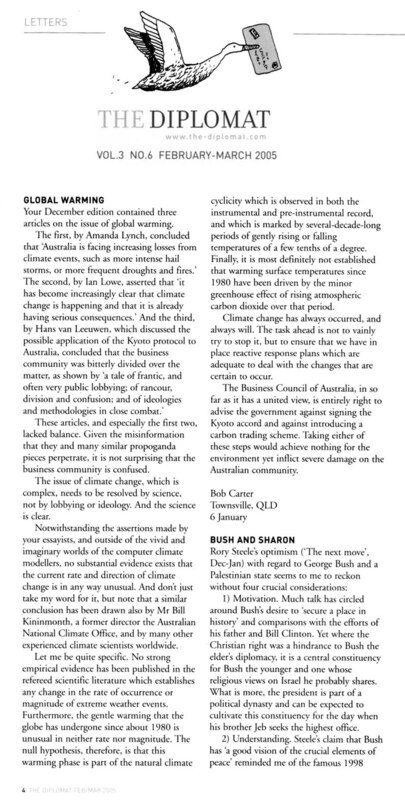 Letters, Gardening Australia, January 2005, p.10, and comments. 14. Who Can Insure Against the Climate? Essay, Institute of Public Affairs (Melbourne), Review, September, 2004, p. 27-28.
Letters, The Age (Melbourne), September 30, 2004.
Letters, Australian Financial Review (Sydney), July 13, 2004. 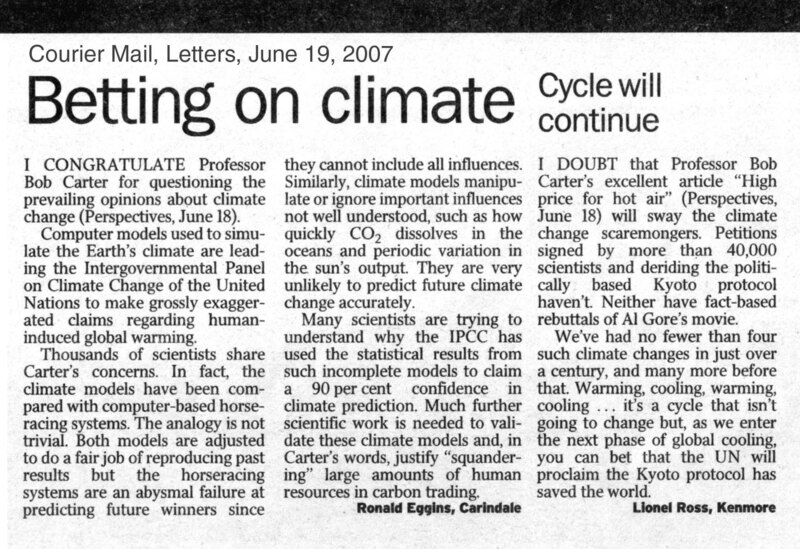 Op Ed by Ian Frazer, Townsville Bulletin (Supplement, p.3) Saturday July 10, 2004. Op Ed, The Australian, June 17, 2004. Op Ed by Deborah Smith, Sydney Morning Herald (News Review, p. 29), June 12, 2004. ABC News in Science, Science Online, June 11, 2004. Op Ed, Tech Central Station (Washington), May 5, 2004. Op Ed, Tech Central Station (Washington), May 3, 2004. Essay, Institute of Public Affairs (Melbourne), Review 55 (4), December 2003, p. 11-13. 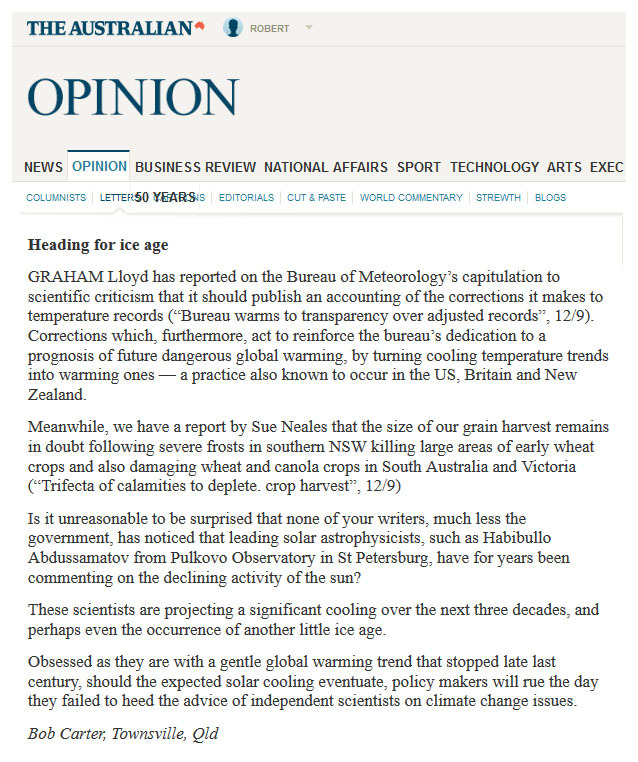 Op Ed, Australian Financial Review (Sydney), November 3, 2003. Science Show, ABC National Radio, November 15, 2003. Weekend Essay, Australian Financial Review (Sydney), September 27, 2003.
Letters, The Australian, September 19, 2003. Op Ed, Courier Mail (Brisbane), October 23, 2002.